Lo mai gai (Chinese: 糯米雞 or alternatively, 珍珠雞 literally meaning "pearl chicken"), is a classic dim sum dish served during yum cha hours. The dish is also called by the literal English translations such as "steamed sticky rice with chicken in lotus leaf wrap." Lo mai gai is mostly a southern Chinese food. 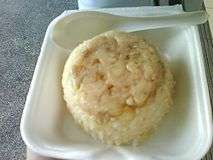 It contains glutinous rice filled with chicken, Chinese mushrooms, Chinese sausage, scallions and sometimes dried shrimp or salted egg. The ball of rice is then wrapped in a dried lotus leaf and steamed. In North America, banana, or grape leaves may be used instead. Sometimes lo mai gai is divided into smaller wraps, which are known as chun chu gai (Cantonese, 珍珠雞) literally meaning "pearl chicken" in Chinese. Due to the flexibility of the lotus leaf, lo mai gai is typically wrapped to form a rectangular parcel. Zongzi is wrapped using bamboo leaves into a triangular based pyramid (tetrahedron). 1 2 3 4 Hsiung, Deh-Ta. Simonds, Nina. Lowe, Jason. (2005). The food of China: a journey for food lovers. Bay Books. ISBN 978-0-681-02584-4. p27. ↑ Sunflower (4 July 2009). 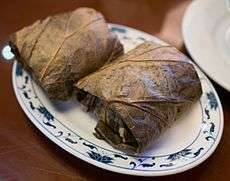 "Lo Mai Gai 糯米雞 (lotus leaf wrapped chicken rice)". Retrieved 15 August 2012.